Marketed by Pam Golding Properties, the upmarket Quadrant Gardens retirement development in Claremont has officially launched and units are now selling. Available on a Life Right basis, the apartments will offer retired buyers the same benefits as owning a sectional title property but without the associated costs. 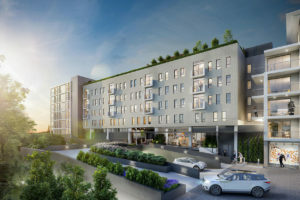 “Underlining the demand for this kind of retirement living, seven of the apartments were sold prior to the development’s official launch this month,” says Bev Bloch, Pam Golding Properties expert in Retirement Sales in the Southern Suburbs. Forming the fourth and final phase of The Quadrant development – a mixed-use complex that already comprises 150 apartments – Quadrant Gardens will be jointly owned by Corevest, the developers of The Quadrant, and the CPOA whom have owned and managed retirement properties for 65 years. In addition to the apartments, The Quadrant also has 3,500m2 of consulting office space and 1,500m2 of retail space. This includes a hairdreser, renowned Italian restaurant, coffee shop, massage spa, wellness centre, gymnasium with 25-metre indoor pool, as well as the public library. Quadrant Gardens itself will offer its residents a rooftop terrace with a recreational area and croquet court, an in-house restaurant, private courtyard garden, lounge and library. Designed for the over 60s, Quadrant Gardens will consist of 75 spacious apartments, ranging from studios to large two and three bedroom apartments, at a starting price of approximately R2 million through to R6.5 million. Bloch says the advantage of a Life Right purchase, which gives the owner the security of tenure for the remainder of his or her life, is that unlike with sectional title, a Life Right purchase is not a property transfer so there are no bond registration fees, transfer duties and no VAT payable. However, Life Right residents do enjoy the same privileges as buyers of sectional title units, and the developer who retains sole ownership of each unit is responsible for the development’s external maintenance. The units, intended for independent living with the option of assisted living offered through CPOA’s Care Packages, will be equipped with emergency care-call communication, while an on-site 19-bed Care Centre will be available for residents who require around-the-clock care. Located in Claremont’s medical precinct, tenants will also have easy access to emergency, high-care and surgical facilities at the nearby Life Kingsbury Hospital as well as the 40 or so specialist consultants based at Library Square and surrounds. With construction well underway, having already progressed to the second floor, Quadrant Gardens is set for completion during the first half of 2019 and will bring to life the concept of luxury urban retirement in the Southern Suburbs. To find out more about this new development, please contact Kimberly Brady on 021 686 7830.